During a recent trip to our daughter Jill’s home, we visited the Munson-Williams-Proctor Art Institute in Utica, NY. 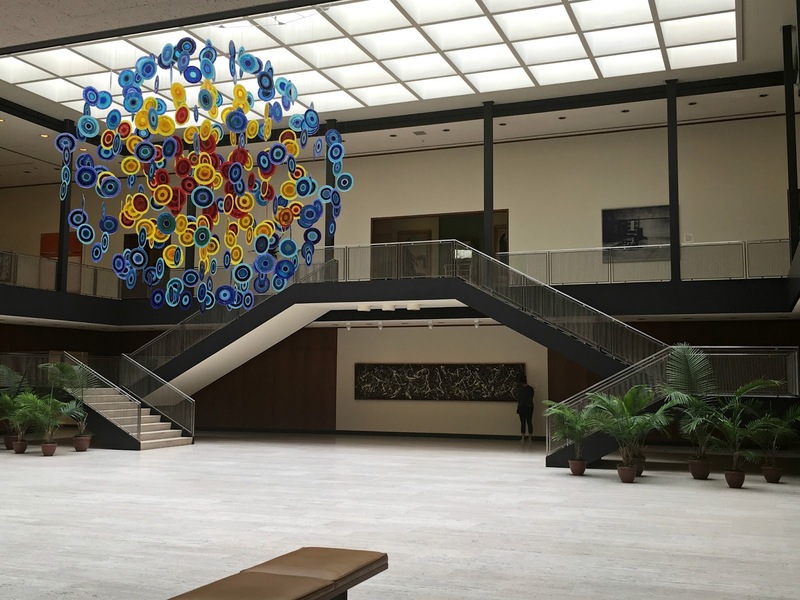 Here in the sky-lit atrium, Abbey examines a Jackson Pollock painting on canvas using aluminum paint and duco (an automobile paint produced by DuPont). 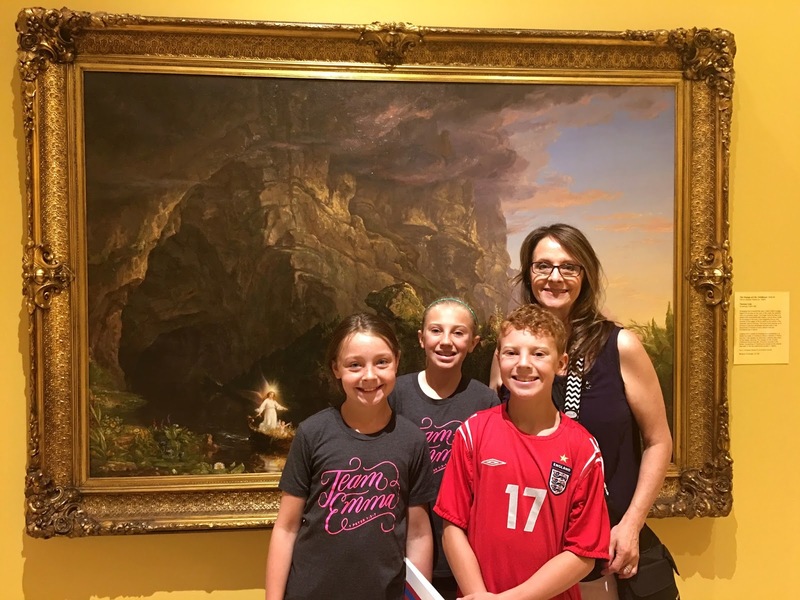 Abbey makes museum visits so interesting because of her art knowledge and familiarity acquired from her many art history classes. What I most enjoyed was a series of paintings created by Thomas Cole. The Voyage of Life, 1839-1840. 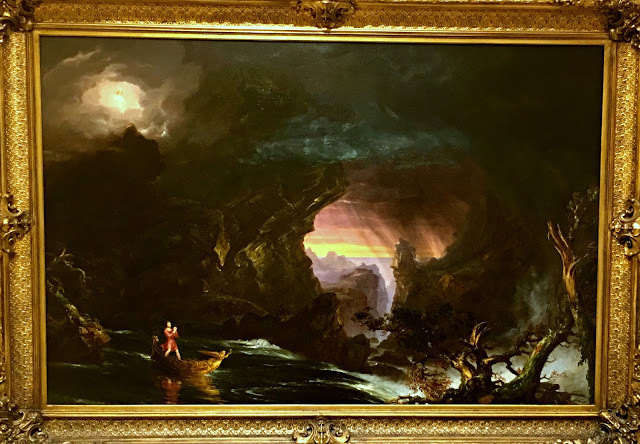 Oil on canvas, Museum of Art, Munson-Williams-Proctor Arts Institute represents an allegory of the four stages of human life: childhood, youth, manhood, and old age. The four pictures depict a voyager who travels in a boat on a river through the mid-19th-century American wilderness. 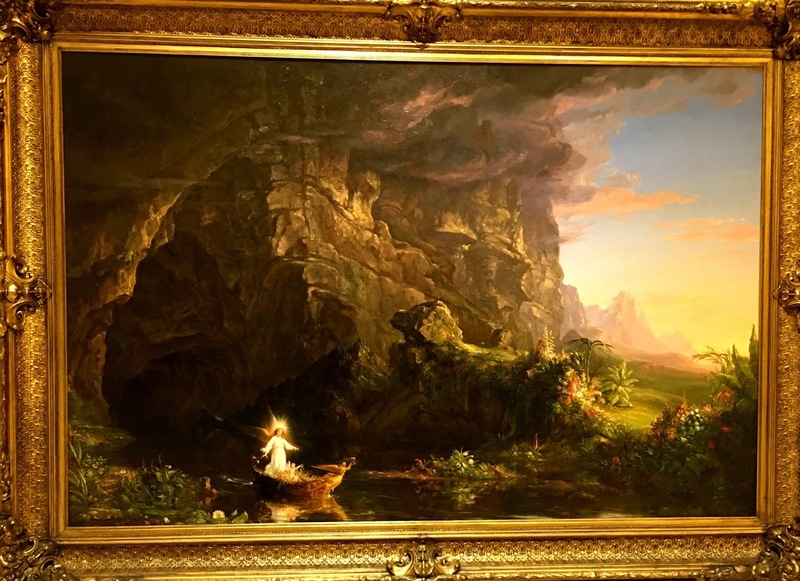 In each painting the voyager rides the boat on the River of Life accompanied by a guardian angel. 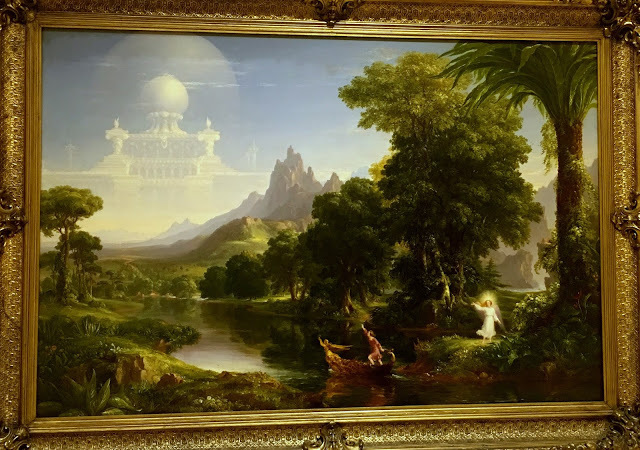 Early in March of 1839, the prominent New York banker and philanthropist Samuel Ward Sr. commissioned Thomas Cole to paint an allegorical series of four paintings titled “The Voyage of Life,” the subject of which he had conceived in the fall of 1836. 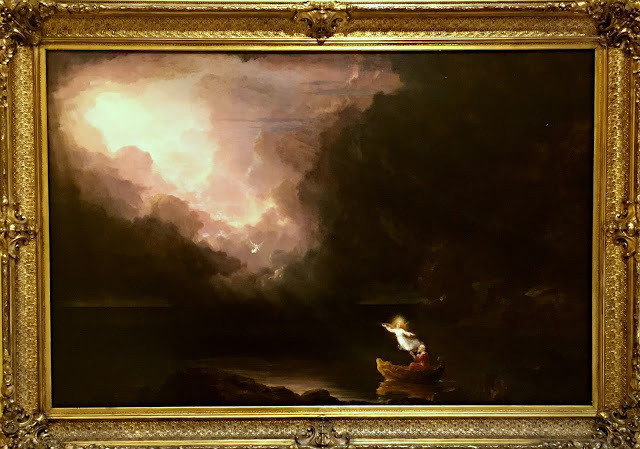 For a excellent in-depth and interactive look at these four painting, click Explore Thomas Cole then click the decode tab. In childhood, the infant glides from a dark cave into a rich, green landscape. Notice on the prow of the boat, an angel holding an hourglass, which is full at this stage in the Voyager’s life. In the second painting, the infant Voyager has grown into a teenage boy, who confidently steers the golden boat towards his dreams, the shining castles in the sky. The guardian angel has exited the boat and stands on the riverbank, gesturing towards the Voyager with a troubled look. Finally, the man becomes old and the angel guides him to heaven across the waters of eternity. The Voyager sits in the boat, as he did in childhood but is now an old man. He floats from the river into the “Ocean of Eternity.” Notice how the sculpted figures on the boat also droop with old age. The angel rejoins the Voyager at the end of his days to lead him to heaven. The hourglass has completely broken off the boat: the Voyager’s time is up. What interesting paintings!! Thanks for sharing!! This could be a "day trip" for us. Thanks for the heads up.